There is something about snow that reminds me to blog. 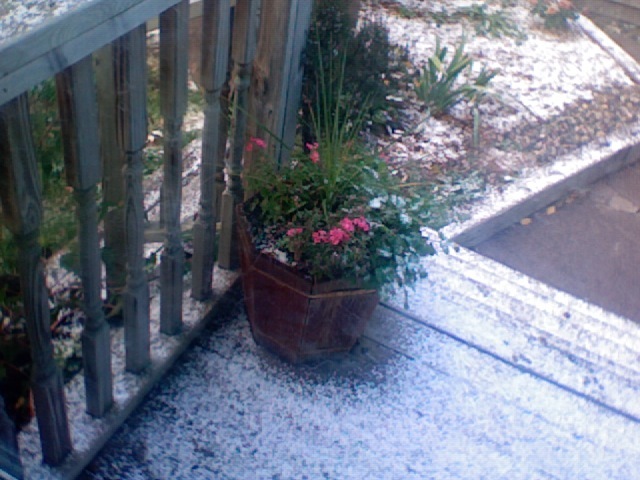 (Yes, that's a sprinkling of snow on my deck.) After all, the blog is called Phenomenological Visions and right now the predominant phenomenological vision out my window is one of swirling flakes. Snow has come early to the north land. Very little of it is sticking to the ground but there it is none the less; frozen crystals of water formed on microscopic dust. They say it wil be a mild winter. We shall see. I guess I need to go home and finish lacing my snowshoes.